I’ve had this little booklet in my drawer for a few years and decided to find out a little of its history. In this modern age of digital photography where most of the thinking is done for us by the DIGIC6 or EXPEED4 processor, I think it is still beneficial to understand and remember the roots of photography. At least for my own photographic journey, the more I learn and experience, the less of a reliance I have on the technology, I use manual modes more often, I turn off many features and I use single-point focusing. 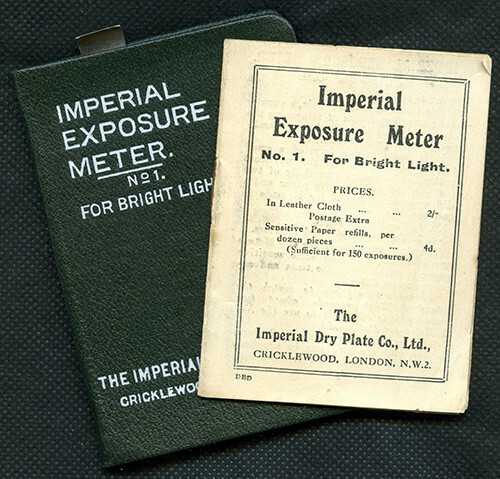 This article describes the Imperial Exposure Meter; it is clear from the meter that one of the main problems photographers of 100 years ago had to endure was very insensitive plates. They did however, have amazingly high resolution that even the new 50 mega-pixel Canon 5Ds cannot even come close.